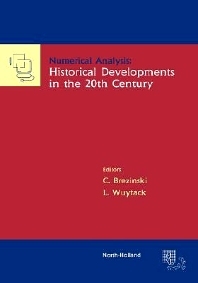 Numerical analysis has witnessed many significant developments in the 20th century. This book brings together 16 papers dealing with historical developments, survey papers and papers on recent trends in selected areas of numerical analysis, such as: approximation and interpolation, solution of linear systems and eigenvalue problems, iterative methods, quadrature rules, solution of ordinary-, partial- and integral equations. The papers are reprinted from the 7-volume project of the Journal of Computational and Applied Mathematics on '/homepage/sac/cam/na2000/index.htmlNumerical Analysis 2000'. An introductory survey paper deals with the history of the first courses on numerical analysis in several countries and with the landmarks in the development of important algorithms and concepts in the field. Approximation in normed linear spaces (G.A. Watson). A tutorial history of least squares with applications to astronomy and geodesy (Y. Nievergelt). Convergence acceleration during the 20th century (C. Brezinski). On the history of multivariate polynomial interpolation (M. Gasca, T. Sauer). Numerical linear algebra algorithms and software (J.J. Dongarra, V. Eijkhout). Iterative solution of linear systems in the 20th century (Y. Saad, H.A. van der Vorst). Eigenvalue computation in the 20th century (G. H. Golub, H.A. van der Vorst). A survey of truncated-Newton methods (S.G. Nash). Cubature formulae and orthogonal polynomials (R. Cools, I.P. Mysovskikh, H.J. Schmid). Computation of Gauss-type quadrature formulas (D.P. Laurie). A review of algebraic multigrid (K. Stüben). From finite differences to finite elements: A short history of numerical analysis of partial differential equations (V. Thomée). A perspective on the numerical treatment of Volterra equations (C.T.H. Baker). Numerical methods for ordinary differential equations in the 20th century (J.C. Butcher). Retarded differential equations (C.T.H. Baker).